They say life is about the journey, not the destination. Well in Las Vegas, we certainly agree and we strive to put our own twist on this timeless cliché. Las Vegas is an adult playground boasting world famous nightclubs, world-class shows and extravagant hotels with worldly themes. Visitors and locals alike can quickly escape to Venice, Italy, at The Venetian, complete with gondolas and a backdrop of St Mark’s square in the Grand Canal Shoppes. Just a few blocks away, visitors can eat crepes or buy baguettes at Paris Las Vegas, complete with the Eiffel Tower and Arc de Triomphe and don’t forget, a breathtaking visit to the Big Apple with sites from the Brooklyn Bridge to the Empire State Building, the Statue of Liberty and the skyscrapers of Manhattan. With all of these amazing destinations, one can quickly forget all of the other amazing things to do in Las Vegas. With over 330 restaurants on the Las Vegas Strip, rarely does anyone pay homage to the culinary delights that accompany these worldly landmarks but that’s just what we’re going to do today. 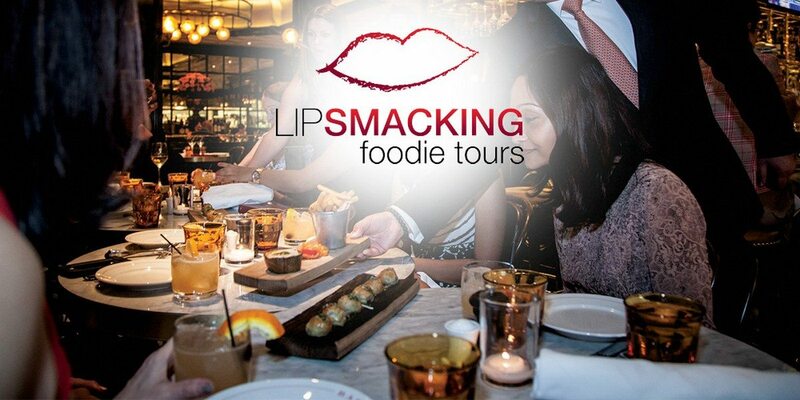 So follow your tummies, and our palettes, as we take you on a journey of the Savors of The Strip with our friends from Lip Smacking Foodie Tours. I recently had the pleasure of experiencing this tour and was honored that our VIP host that evening was Donald Contursi, the President of the company. This food tour is more than just fine dining and walking along the famed Las Vegas Strip. It’s also a lesson in fine art, the history of Las Vegas and the opportunity to make new friends from around the world. 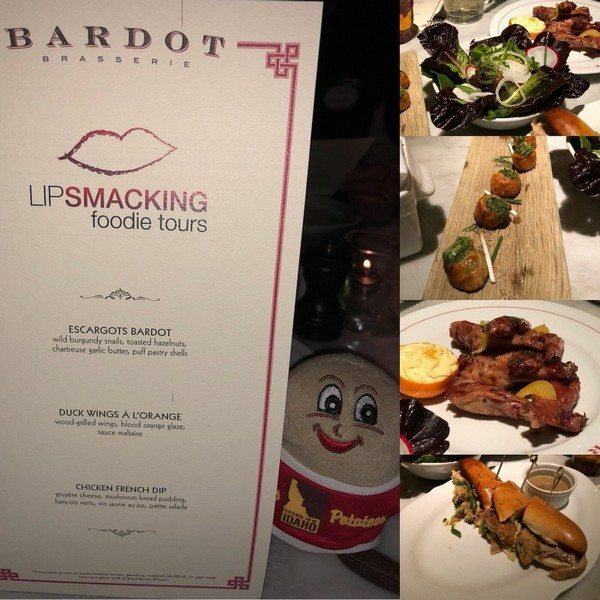 The first restaurant we visited was Bardot Brasserie inside the ARIA Resort & Casino. This is more than just a restaurant boasting classic French cuisine. Chef Michael Mina’s menu features iconic signature dishes including Escargot Bardot, Duck Wings A L’Orange and a delectable Chicken French Dip … it was like Thanksgiving in my mouth with its Gruyère Cheese, Mushroom Bread Pudding, Haricots Verts (thin french green beans), Vin Jaune Au Jus (yellow wine au jus), and a petite salad. After a brief walk down to the main lobby of the Aria, the second stop of the evening was at Sage. Here, the James Beard award-winning Chef Shawn McCclain, has created a menu of American cuisine with global influences, artisanal meats, sustainable seafood and farm-to-table produce. Take it from me, someone who avoids oysters at all costs, I was extremely surprised and delighted to partake in the first appetizer of the evening. No slimy feel, no oceanic taste, just the best Kusshi Oyster that could ever be consumed in a Las Vegas hotel on a Monday evening! We also enjoyed a fare consisting of a Roasted Heirloom Beet Salad, Roasted Veal Sweetbreads and a Foie Gras Bruleé – so delish. Who knew that a fruit compote mixed with a toasted cocoa nib (fermented, dried and crushed cacao bean) and duck liver could be a delight when spread over a sweetly toasted brioche? Certainly not me, but now I do and I cannot wait to experience it again! After leaving Sage, we took a walk through the beautiful Shops at Crystals, an upscale shopping center inside CityCenter, located between Aria and the Cosmopolitan. Anchored by more than 15 flagship stores including Louis Vuitton, Gucci, Dolce & Gabbana, Tom Ford, Prada, Celine, Fendi and Tiffany & Co., there are more than 50 of the finest luxury brands in the world, all located under one roof on the Las Vegas Strip. Here we learned from Donald about the Fine Art Collection that features work of acclaimed painters, sculptors and installation artists. Be sure to stop and see Maya Lin’s Silver River, a recreation of the Colorado River and entirely cast of reclaimed silver and Henry Moore’s Reclining Connected Forms, depicting mother and child in a reclining form, located outside Crystals entrance. Once inside, be sure to take the time to seek out Glacia, a water and ice feature designed by WET, a water feature and fountain design firm based in Los Angeles. This art installation “cools” guests with large pillars of carved ice that rise as tall as 15 feet. As each rises, it is magically whittled into intricate patterns while mesmerizing spectral light contributes of an elegant floor-to-ceiling, liquid chandelier. The third stop was the one I was looking forward to the most as I am a huge fan of Greek food. 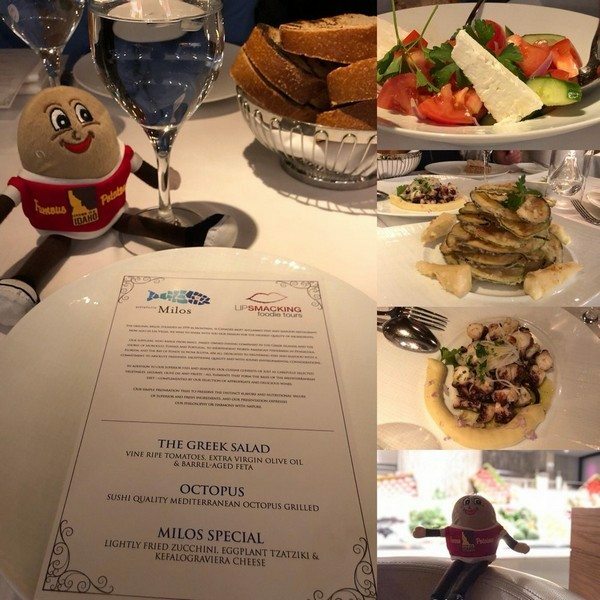 Little did I know that Estiatorio Milos at The Cosmopolitan has their pristine seafood flown in – DAILY and the ambiance of the restaurant is just amazing. As they self-describe, this “one-of-a-kind terrace dining experience enables guests to enjoy the authentic tastes of Greece while overlooking the gorgeous Las Vegas skyline.” Even though this was only the 3rd stop on a tour of 5 delicious locations, I was already beginning to feel full but the moment I walked into Milos, I could already smell their tomatoes – something else for which this restaurant is known! Their Greek Salad is chock full of vine-ripened tomatoes, extra virgin olive oil and barrel-aged feta and as if that wasn’t enough, their Octopus was grilled to perfection! We also enjoyed their famous Milos Special. Sliced and beautifully presented, this stacked tower of lightly fried zucchini surrounding an eggplant tzatziki has a special surprise of warm, fried Kefalograviera Cheese along the outside of the plate. Be careful … you still have 2 more stops to go but you will want to devour everything on your plate here! 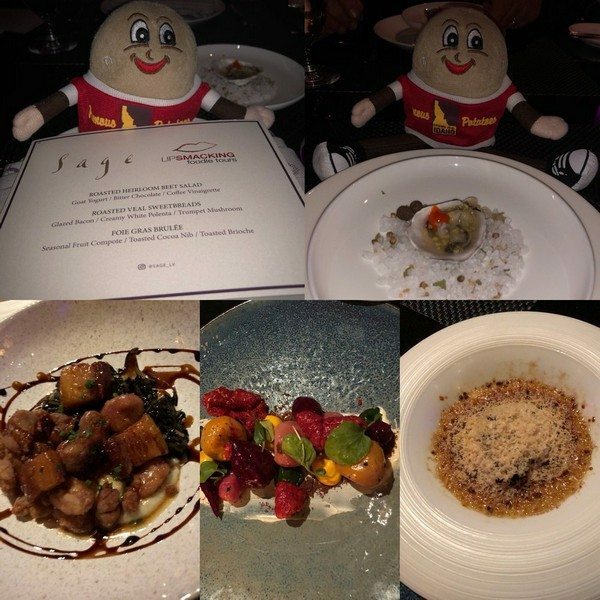 Our 4th stop was at scarpetta inside The Cosmopolitan. Who would ever think that on a 5-Star dining tour that a simple, elegant and immortal classic like Spaghetti would be a signature menu item? This flavorful and delightful dish was presented in such a unique way that when the glass top was pulled away, the entire table ooh’d and aahh’d! 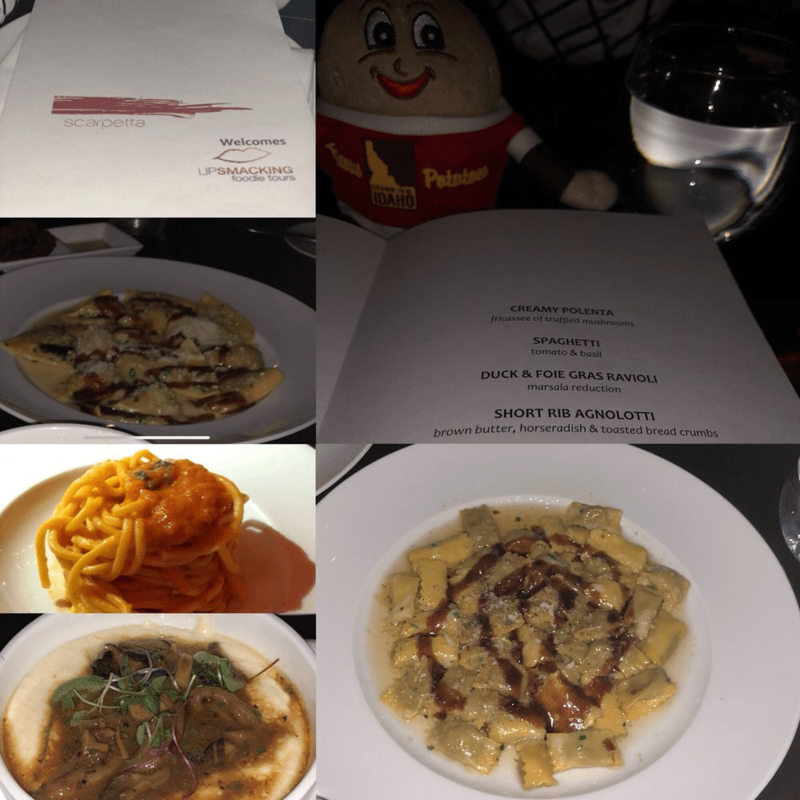 In addition to this, we feasted on their Duck & Foie Gras Ravioli with a marsala reduction and their Short Rib Agnolotti. This was served in brown butter with horseradish & toasted bread crumbs and I was sure I would need to be rolled out of the restaurant! A pleasant surprise happened during our walk back to the Aria. Prior to leaving the Cosmopolitan, we paid a visit to Thierry at Retrospecs & Company, a not-so-hidden gem just before the skywalk between the Cosmopolitan and the Aria. This store is as much of a collection of museum-quality pieces as it is a fully functional eyewear fashion store. With over 70 locations in the US and nearly 50 throughout Europe, they cater to clients who appreciate unique and precious eyewear from the 1890s-1980s. Featuring a fully restored, 4-ton safe from 1910 that houses historical pieces of eyewear from Mahatma Gandhi, John Dillinger, Johnny Depp, Ozzy Osbourne, Zsa Zsa Gabor, the first Ray Bans ever made (1937), the Las Vegas location has so many other eclectic and eccentric pieces. The most amazing find was a pair of Snow Goggles made by the Inuit from Caribou antler to prevent snow blindness (dating back to the early 1000s). This location owns 1 of just 3 pair to be known to be in existence. To say we saved the best for last is an understatement. 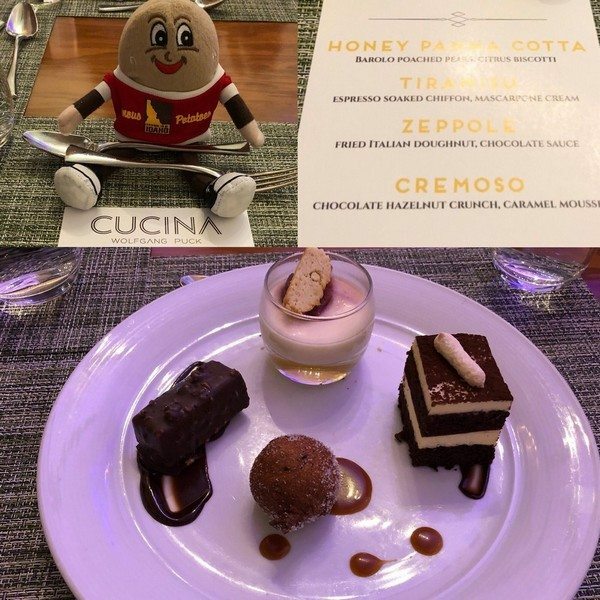 The final stop was for dessert at Cucina by Wolfgang Puck inside the Shops at Crystals. After opening Spago inside the Forum Shops at Caesars, Wolfgang went on to open 6 more restaurants throughout Las Vegas, including this Italian-themed, technically “off-strip” location, in 2010. The spot for this restaurant provided us with a birds-eye view of Crystals and their retail shopping establishments. Upon sitting at our table, we were presented with 4 delectable desserts by Chef Tim Duda, who took the time to present these tableside. This was certainly a welcome touch! Their Honey Panna Cotta, a Barolo Poached Peach Citrus Biscotti, is light and sweet as a tasty confectionery-styled concoction. Their twist on the classic Tiramisu is an Espresso Soaked Chiffon with layers of Mascarpone Cream. As someone who’s never been a fan of the overly alcohol-soaked treat, this was a wonderful and mellow delight. Lastly, their Cremoso, Donald’s favorite, is a heavenly Chocolate Hazelnut Crunch with a Caramel Mousse inside. Of all 4 desserts, Zeppole was my favorite! A fried Italian doughnut in a chocolate sauce was the perfect punctuation to end this Lip Smacking evening. Now that we’ve your teased your taste buds with this delectable Savors of the Strip foodie tour, you might be wondering how you can experience your own Lip Smacking Foodie Tour on your next trip to Las Vegas. 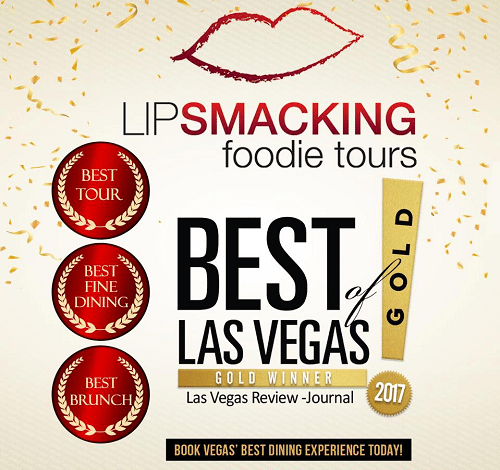 The recent winner of 3 separate Best of Las Vegas 2017 awards (Best Tour, Best Fine Dining and Best Brunch), and with nearly 1,300 5-Star reviews on Tripadvisor, you’ll want to make your reservations early as these tours do book out in advance. Their pricing includes food at 3-5 restaurants, your VIP foodie host, taxes and all gratuities with some tours also offering a signature cocktail upgrade. Simply visit The Tour Exchange and select the tour that speaks to your inner foodie and fits your travel schedule. Their Boozy Brunch tour operates Saturdays & Sundays at 10:30am with cocktails & mocktails included and the Afternoon Culinary Adventure operates Tuesdays-Thursdays & Sundays at 2:30pm. For those interested in exploring the refurbished and rejuvenated Downtown Vegas there are tours available at 5pm on Fridays & Saturdays. Of course their signature tour, the Savors of The Strip, is available Sundays-Thursdays at 6pm and for those that would like to add an exclamation point to their evening, can opt for the Savory Bites & Neon Lights tour that includes a Vegas Nights helicopter flight over the Las Vegas Strip, after the tour, with Maverick Helicopters. Custom tours and group events are also available, simply give our friendly Travel Concierge at call at +1-844-866-7392.